Millennials, also known as Generation Y, are the largest generation in the United States and one-third of the total U.S. population. This generation, roughly defined as born between 1980 and 2000, is a major contributor for the U.S. economy and the new age of spa goer. Caesars Entertainment recognized this fact when they opened the LINQ Hotel & Casino in 2014 and again when the hotel unveiled its spa in May 2015. 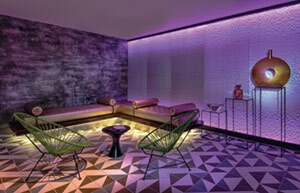 The Spa at the LINQ offers millennials—and all of its clients— total body wellness, from its unique treatments to its salt cave and fitness center. The spa is located on the sixth floor of the hotel, situated to be an oasis from the busy dining, cocktail and gambling that occurs mere steps away. The spa could be described with one word: eco-chic. This is reflected as soon as you enter the reception space. It features contrasting walls of muted, earthy green and gray balanced with a geometric, tiled walkway and a smattering of Himalayan salt objects and organic skin care products. “But why eco-chic?” you might wonder. Spa operations manager Joy Matti sat down exclusively with Skin Inc. to discuss the spa’s inspiration, its incredible customer service and innovative offerings. Skin Inc. (SI): Your spa was designed for millennials, but what is the connection between this generation, the environment and wellness? Joy Matti (JM): The millennial is really into prevenative wellness, and they want to be proactive about their health. For this, we have a state-of-the-art fitness center, a salt cave, aromatherapy in every treatment and a Harmonize Water Bar in the lounging area. The Harmonized Waters by Osmosis are available to clients free of charge to add to their waters for wellness benefits. The generation is also about being kind to their environment, so we carry all organic skin care and have some organic treatments [Organic Facial and Organic Spa Manicure]. SI: What is your most popular treatment? JM: Our most popular treatment right now is the Restoration Mind & Body Massage. It is our relaxation massage with Swedish, light-to-medium pressure to improve circulation and calm muscles. It incorporates some aromatherapy opening and closing rituals, where guests gets to pick the scent of their choice. Our Seasonal Pedicure is also popular. We use new tools for every pedicure, and we give a gift bag to the client with the tools used in the pedicure to be used long after. The pedicure starts with a foot soak, which is changed every season. SI: What are your unique offerings? JM: We have a fitness cart, which can be ordered by any hotel guest from the spa free of charge so they can work out in their own room. We also offer a Thai Massage, which is an assisted stretching massage that takes place in our salt cave. Our Alaskan Glacial Mud Wrap is also unique. I first saw [Lauren Padawer] from Alaska Glacial Mud Co. on Shark Tank. The more she was in the mud, the better her skin looked. The mud is carved out from the Copper River delta. It detoxifies the body and moisturizes, so it is unique in that it pulls out impurities and puts moisture back in. You can buy soap and a mask to take home. They are environmentally friendly, and the company gives back to Alaska. SI: How do you market? JM: We try to hit social media, such as Twitter, Instagram and Facebook, as much as possible. We try to post our specials on Twitter. We also have done some radio interviews and blogs and a lot of magazine articles. SI: Have you held events? JM: We are the exclusive sponsor spa for the Las Vegas Marathon in November. This is very exciting for us. We will be at the marathon and then have designed two treatments for post-recovery, which will be advertised to runners. Those will be the Runners Release Pedicure, which will use cold and heat to numb the muscles; and a Post Recovery Massage, which will combine two modalities of the runner’s choice and include some hot towel compresses. The cave will be available for both services, since it is really good for pre- and post-recovery of the lungs. SI: What are your customer service strategies? JM: We did a lot of training prior to opening. Smove is our policy, which stands for Smile & Move, a book on customer service by Sam Parker. [We] enjoy making good things happen for others. We have a checklist to make sure we are handling all of our customer service strategies. SI: How do you maintain high customer service? JM: We have clients who feel that the service level is really high here. Since we are not huge, we can go that extra mile. We offer fresh-squeezed juice or can grab them lunch if they are hungry. We want them to feel like we’ve taken the time to provide them with a unique experience. We were also able to get the best treatment providers, who have a great amount of knowledge and expertise and are happy doing what they do. SI: What are some of you retailing strategies? JM: Our retail strategy is to sell things that the clients enjoy during treatments and want to take home. We just have some fun, kitschy retail related to the Himilayan salt in our salt cave, such as Himilayan shot glasses, bath salts and salt cooking blocks. SI: What does the future look like? JM: We are going to keep providing clients with great service, but if we really see a business need, we have room to expand. The Spa at the Linq has been lauded for its customer service, and after visiting it in person, I see why. Upon entering, I was kindly greeted by my host and escorted to the first of two tranquil lounge areas to set my intention with a Himalayan salt crystal and complete an intake form. My esthetician, Melissa, then introduced herself and showed me to the locker room, a modern and relaxing space where I could change into my robe and slippers while partaking in any of the room’s personal care amenities. I then entered the second lounge area and relaxed on a chaise draped in olive green while I perused the myriad of beverage options from organic tea to Harmonized Waters. The staff kindly organized a few minutes for me in the Himalayan Salt Cave before my service. The salt cave should be experienced for at least 45 min. to reap all wellness benefits; however, my 20 minutes in the salt cave felt like the reset button I needed, where I floated peacefully in a zero-gravity chair, breathing deeply and emptying my thoughts. Once in my treatment room, my Signature Facial began with the selection of one of three 80 Acres aromatherapy scents: Verde, Lavender and Blood Orange. I couldn’t decide between the Verde and Blood Orange, and Melissa was happy to customize the scent for me. Each Signature Facial is customized to a client’s skin type and concerns with natural fruit enzymes, antioxidants, vitamins and botanicals. While I waited for the enzymes to do their magic, Melissa proceeded to do a neck and hand massage. I was offered the chance to customize my experience with a number of add-ons, and although I narrowed it down to a foot scrub or a collagen gel mask, I ultimately decided the collagen mask was more needed. It should be noted, that the spa offers all clients the opportunity to select one of their sound effects or plug in their own iPod for a more customized musical experience. After noticing that I had acquired a few milia on my upper cheek area, Melissa offered to try to remove some of them. She was careful and patient, and I felt as though she really cared about my skin—the mark of an excellent esthetician. After my service had concluded, I had to leave the spa rather quicky; no time to experience the Eucalyptus Steam Room, whirlpool or steam showers (which were all complimentary). No, I had to get to a business meeting, like I’m sure many others have to. But for those short few hours that I was in the Spa at the LINQ, I was in true bliss. 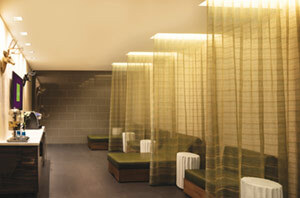 Above: Intake forms are filled out in the spa’s tranquil lounge. 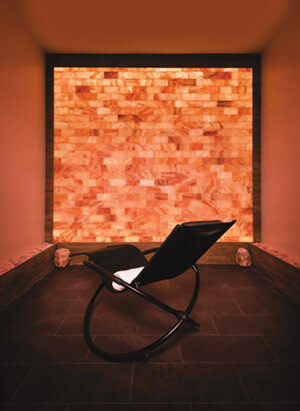 Right: Clients breathe deeply for respiratory and muscle benefits in the Himalayan Salt Cave. Virtual trails are offered in the fitness center. Fitness cart provides stability ball, yoga mat, fitness discs and foam roller for four hours.